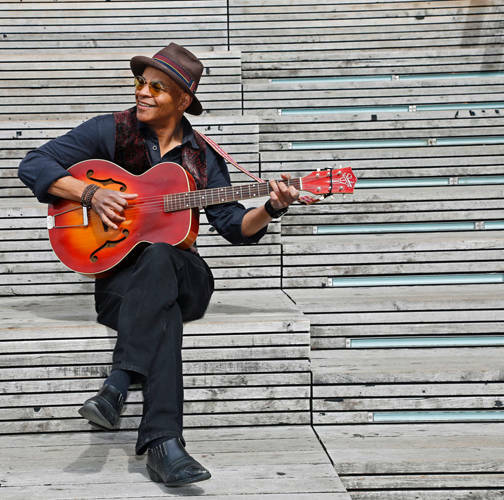 Blues musician Guy Davis, a 2017 Grammy Award nominee for best traditional blues album of the year, will perform in the Hayner Ballroom at 7:30 p.m. Sept. 29. TROY – Blues musician Guy Davis will perform in the Hayner Ballroom at 7:30 p.m. Sept. 29. He is a 2017 Grammy Award nominee for best traditional blues album of the year. Released in 2017, “Sonny & Brownie’s Last Train” is his 18th album, which pays tribute to the legendary Sonny Terry and Brownie McGhee, whose work helped to shape Davis’ music and life. Davis is the son of 1950s, ’60s and ’70s movie actors: Ruby Dee and Ossie Davis. He first learned about the blues from his Georgia-born grandparents whose stories made an impression on him in his youth. He taught himself to play the guitar and banjo and used the unique opportunities afforded him by his famous movie star parents to develop his perspective and sound. He has appeared on the David Letterman Show, Conan O’Brien, A Prairie Home Companion and World Café to name a few, but at 7:30 p.m. Sept. 29 he will bring the blues to the TroyHayner Cultural Center. This event is free, but capacity is limited. Housed in an elegant Norman Romanesque mansion, in the heart of downtown Troy, the Hayner provides a wide variety of cultural events such as exhibits, classes and music often at no cost. The Troy-Hayner Cultural Center is supported by the citizens of the Troy City School District through a local tax levy and gifts to the Friends of Hayner. Learn more about these free events at www.TroyHayner.org or call 937-339-0457 to join Hayner’s mailing list.